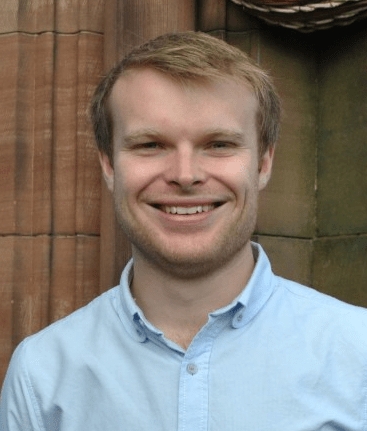 Glasgow Labour activist Michael Shanks welcomes the change of heart on Cornton Vale’s replacement, but says we need to look at the wider picture of imprisonment in Scotland. Yesterday morning’s news was full of talk of a ‘u-turn’, that cardinal sin in politics of changing your mind. This particular u-turn was absolutely right — to reverse a plan to build a £75m replacement for Cornton Vale Prison. The narrative surrounding the decision, however, seems to be based on the premise that female offenders are fundamentally different to all other offenders. There are differences — just as there are differences between young offenders and adult offenders, or between those on short term and long-term sentences — but fundamentally if the Scottish Government now accepts the argument that locking people up in centralised prisons doesn’t work, then that logic must be extrapolated to the entire prison population. There is an opportunity for Scottish Labour to take the Justice Secretary’s first step as a starter for ten in developing a forward-thinking, progressive approach to prison. One caveat on what follows. There will always be a cohort of men, women and young people for whom secure accommodation and prison is the best and only option for their own and for society’s protection. Those individuals require long-term incarceration because desisting from future offending cannot be guaranteed and recidivism — particularly violent recidivism — is likely. The average daily population of that cohort was 838 in 2011/12. The remainder of the prison population — an average of some 5,738 — are serving a variety of terms: 2,264 for a sentence of fewer than two years (that’s more than a third of the entire prison population) and 1,172 for a term of fewer than four years. 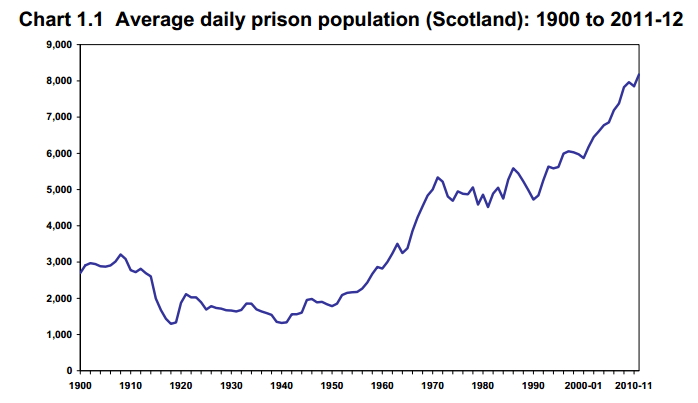 The prison population in Scotland has been steadily rising with peaks and troughs since the 1900s. The Oxford History of the Prison is an excellent read. Not just as an insomnia cure (although Chapter 1 on the medieval world of prisons does that job well) but as an insight into the failures of prison through the ages as a way of reforming behaviour. a desire to reform the individual away from recidivism. The last one — reform and rehabilitation — always seems to come last. Reform and rehabilitation isn’t a new concept. Howard and Fry and Brebner and Osborne all knew that the underlying philosophy of prison being a punishing experience didn’t work. The Chief Executive of the Scottish Prison Service gave an excellent speech in June 2014 which was only recently published. It is well worth reading in full. In it, Colin McConnell speaks of William Brebner, the Governor of the South Prison in Glasgow in the 19th century. (The Herald ran an obituary of Brebner which sums up his life and works well). Brebner’s response was for prison became a positive experience. He pioneered the idea of a ‘single prisoner prison’ — a prison focused on individuals not a population at large, with the sole aim of reforming the individual so they could go back into society as a reformed character. His approach was far from warm and cuddly. He wasn’t in the business of appeasing anyone and his prison was far from Butlins. But his philosophy was that imprisonment should serve a useful purpose by training people to work, by educating them and by restoring their physical and mental health. Much of Brebner’s work is alive in the prison service of today. However his focus on individual approaches to working with offenders is one we should consistently return to. Prisons should never be warehouses to store for a pre-determined period of time those whom society has judged should be punished and forced to pay for their actions. It’s too expensive and, more importantly, it doesn’t work. Focusing on rehabilitation isn’t about a softly softly approach. Wanting to reduce future criminal activity isn’t being ‘soft on crime’. And locking people up for short sentences which cause massive upheaval is not being ‘tough on crime’. So whilst the decision not to build the new jail in Inverclyde is a welcome one, the reasons for the policy change should be equally applied to the entire prison estate. The government has accepted the argument that a one size fits all, centralised, prison-based intervention don’t work, and they have recognised that reform is very much an individualised process. Support in finding employment and housing, rebuilding family connections, developing pro-social relationships, building up self-esteem, addressing underlying health problems (most notably mental health and drug and alcohol misuse) are all ways to support offenders to desist from offending and to reintegrate effectively into society. Much of our recent political chatter is around the Smith Commission and the additional powers it brings to the Scottish Parliament. 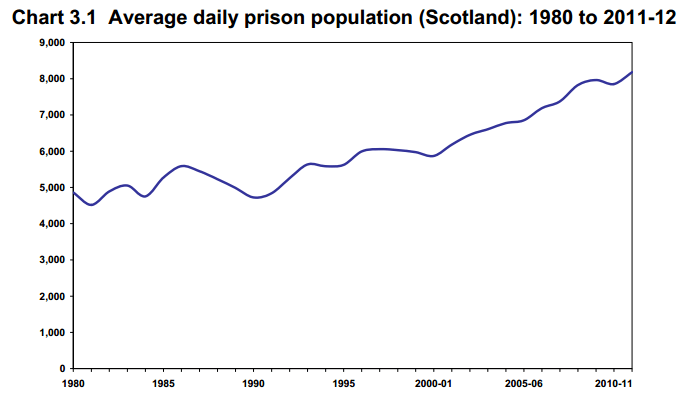 The Scottish Government has had control of justice policy for 16 years and in that time it has not taken a radical step away from the still overwhelming consensus that prison works. It is striking that while some countries are closing jails, we are opening more. Cornton Vale II might be out, but a much enlarged Barlinnie is still on the go. I hope his vision will in time extend to a more modern and progressive system for all offenders in Scotland — young and old, male and female. Scottish Labour should be the champions of that agenda.